A neutron star is a very small and dense star made almost completely of neutrons. They are small stars with a radius of about 11–11.5 kilometres. They have a mass of about twice that of the Sun. They are the smallest and densest stars known to exist in the Universe. They are what is left of a huge star which exploded as a supernova. The density of the star is like that of the nucleus of an atom. They have strong magnetic fields, between 108 and 1015 times as strong as that of Earth. The gravitational field at the neutron star's surface is about 2×1011 times stronger than on Earth. To imagine how dense a neutron star is, take all of the mass of our sun (which has a diameter of 1,392,000 kilometres (865,000 mi)) and push it down into a size that would fit into a ball with a 19 kilometres (12 mi) diameter. Another way to understand the density is this: one teaspoon of matter from the neutron star would weigh 6 billion tons. Neutron stars spin very fast, from 0.001 second up to 30 seconds to turn. They come in different types. They may emit beams of electromagnetic radiation as pulsars. Other types are magnetars and binary pulsars. In 1934, Walter Baade and Fritz Zwicky proposed the existence of neutron stars, only a year after the discovery of the neutron by James Chadwick. 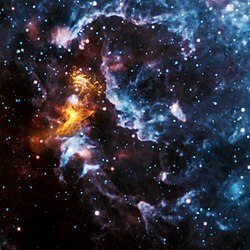 Looking for the origin of a supernova, they suggested that in supernova explosions ordinary stars are turned into stars that consist of extremely closely packed neutrons, which they called neutron stars. Baade and Zwicky suggested that the release of the gravitational binding energy of the neutron stars powers the supernova: "In the supernova process, mass in bulk is annihilated". Neutron stars were thought to be too faint to be detectable. Little work was done on them until November 1967, when Franco Pacini (1939–2012) pointed out that if the neutron stars were spinning and had large magnetic fields, then electromagnetic waves would be emitted. Radio astronomer Antony Hewish and his research assistant Jocelyn Bell at Cambridge soon detected radio pulses from stars that are now known as pulsars. ↑ Naeye, Robert 2006. "Spinning pulsar smashes record". Sky & Telescope. Retrieved 2008-01-18. ↑ Baade, Walter; Zwicky, Fritz (1934). "Remarks on super-novae and cosmic rays". Phys. Rev. 46 (1): 76–77. doi:10.1103/PhysRev.46.76.2. ↑ Chadwick, James 1932. "On the possible existence of a neutron". Nature 129 (3252): 312. doi:10.1038/129312a0. This page was last changed on 18 April 2019, at 18:04.